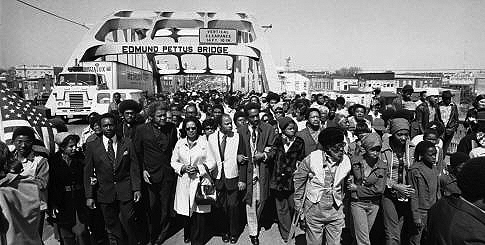 Barack Obama made the most eloquent speech of his presidency in Selma at the 50th anniversary of the bloody march across the Edmund Pettus Bridge, named for a grand dragon of the Ku Klux Klan. He was introduced by Rep. John Lewis, 74, who suffered a fractured skull by Alabama state troopers in that march, as Sheriff Jim Clark’s posse attacked the 600 marchers with billy clubs, which resulted in deaths of three marchers. “We gather here to honor the courage of ordinary Americans willing to endure billy clubs and the chastening rod; tear gas and the trampling hoof; men and women who despite the gush of blood and splintered bone would stay true to their North Star and keep marching toward justice,” Obama declared. The bloody march, broadcast on national TV, shocked the nation, enabling President Lyndon Johnson to push for passage of the historic Voting Rights Act a week later. He declared, “We shall overcome,” quoting the famous black motto. The historic result: there were only 300 African American elected officials in 1965 vs. more than 10,500 now, including, of course, America’s first black President. The New York Times reported that nearby towns were worse. Had Michael Brown been killed 500 yards to the southeast he would have been in Jennings, where black defendants are routinely sent to jail for failure to pay minor traffic fines. Four miles away is Calverton Park, where black motorists were stopped at three times their share of the population and forced to pay court fines and fees that account for 40 percent of the city’s general revenues. In Madison, Wisconsin hundreds marched to protest the killing by a white police officer of yet another unarmed black youth. At the University of Oklahoma over the weekend, a viral video was broadcast of SAE fraternity brothers singing that there were “no niggers in SAE.” The university closed the fraternity, forcing its members to move out within a day and expelled two leaders of the chant from the university. Clearly, racism is pervasive in many sectors of the American culture. What can be done about it? How can today’s culture make our founding ideals more widely shared? The most eloquent spokesman this week was not a leader of the NAACP or the National Urban League, but University of Oklahoma President David Boren, a former governor and U.S. Senator, who closed the SAE chapter and expelled its racist chant leaders.